Sandra Oh has made Emmy history. The 46-year-old received an Emmy nomination for Best Actress in a Drama Series on Thursday for her role as MI5 security officer Eve Polastri in the BBC America thriller Killing Eve, becoming the first actress of Asian descent to earn a nod in that category. Oh will compete with The Crown's Claire Foy, The Handmaid's Tale's Elisabeth Moss, The Americans' Keri Russell, Westworld's Evan Rachel Wood and Orphan Black's Tatiana Maslany. This marks the sixth Emmy nomination for the actress, who was born in Canada to Korean parents. She was previously nominated five times for Best Supporting Actress in a Drama Series for her role as Cristina Yang in Grey's Anatomy. "I feel tremendous gratitude and joy with this nomination," Oh said in a statement to E! News. "I am thrilled for Phoebe Waller-Bridge's nomination and for the entire cast/crew of Killing Eve. I share this moment with my community. PS. I think my mother at this moment may actually be satisfied." 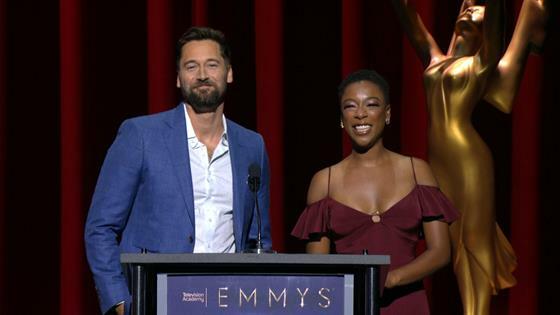 Killing Eve writer Phoebe Waller-Bridge also received an Emmy nod for Outstanding Writing for a Drama Series. In 2010, Archie Panjabi became the first performer of Asian descent to win an Emmy for acting, receiving the award for Best Supporting Actress in a Drama for her role on The Good Wife. In 2016, Riz Ahmed won Best Lead Actor in a Limited Series for his performance in The Night Of, becoming the first male actor of Asian descent to win an Emmy in an acting category.